NGWRC is a 501(c)3 non-profit organization, and your donations are tax deductible. Our paperwork is on file with the state of Kansas and if you need a copy you can get it from the Secretary of States' office. The NGWRC reserves the right to refuse donations from any groups or persons whos' views does not support ours. This section is a very basic introduction into claims, thus it is called ‘Claims 101’ as it is for an average Gulf War Veteran needing help understanding how to start a claim. This is not an in depth review on the CFR, U.S.C or the case-law and just how to apply them. That is what a seasoned agent, VSO and lawyer, (your power of attorney (POA)) is for. This is a down-to-earth how-to guide that is meant to help a veteran, who is working with a “good” POA so that the veteran knows just what their job is when submitting a claim and what it will take to submit a winning claim. From the time, I started the ‘Veterans Information Network’ until now, I have worked to help a large number of veterans understand what is needed in their claims. The VBA is changing the regulations all of the time, and that is why you need someone who is keeping up on those changes. Even as I write this, it can become out of date before I am done. The VBA can change section 3.317 next week and that could make a lot of difference. The regulations on how you file paperwork with the VBA changed in March 2015. The examples are just that, examples. Every claim is different and you cannot use any of the examples as your own write up. The other part of this you need to remember is that every VARO is different, while they should not be, they are. While the laws and regulations are all the same, they do not always get applied that way, and after helping veterans in many different VAROs, that point is very true. Some of the VAROs could not care less what the 38 U.S.C. or 38 CFR has to say about lay statements or what the court rulings say. They just do not count the veterans’ lay statements when working the claim, Gulf War or not. This is an error if your statement is credible. You just need to do the best job from the start, keep doing it, and pointing out the errors and plan to win at the Board of Veterans’ Appeals. Someone in a DAV training class told me that once. The Fully Developed Claims (FDC) Program was developed to provide a faster decision to veterans who are able to get all of your evidence together to prove their claim (case) for benefits. Your POA might help you with this and insure you are filing with the right evidence. Some POAs will file for everything. Then when you tell the VA about your government records for your claim, the VBA will get them for you. You will need to provide all private (non-government) medical records that will prove your claim. The VBA has a form for everything that a veteran needs to be using. The instructions for the VA Form 21-526 EZ does tell you the forms you need for your claims. The VBA changed the regulation of 38 CFR 3.157 on inferred claims in March, 2015. A veteran now will need to file a claim for the issue that once could be inferred from your statements or exams. Now if it appears as if you are inferring a claim in your statement or in your NOD, the VARO will address it as an Intent to File (ITF). The VARO should send you a notice of the ITF and a 526EZ so that you can file a claim. Do file the claim. The ITF is to protect the earliest possible effective date claim for your benefits on the claim you want to file. The ITF will allow you NO MORE than one year to get all of the evidence to support your claim. It will be date-stamped when received by the VBA. EXAMPLE: You file an ITF on November 10, 2015 for migraines and you lived in Topeka, Kansas. You now have until November 9, 2016 to have everything date stamped by the Wichita Kansas Regional Benefit Office (VARO). You always want to get a date stamp copy for your file from the VARO. Your VSO will help you to insure this does happen. This is why you should not take the full year as you want to get it in before the end and to make sure you do make it on time to the VARO. The VARO will send you some paperwork in the mail after you do this. You do not have to respond to this mail until you have all of the evidence for the claim ready to be sent back to the VARO. If you send or call them and state you are filing for “IBS,” you just stated the claim without the evidence you wanted to send in. There is an 80% chance the claim will be denied. When you file with the VA for the first time, it is an original claim and there is no evidence in the claims file but what you send in. That is why you, the person starting the claim, needs to insure that you include all of the evidence and all forms that you plan to submit. Example: You did the ITF for a claim on IBS and the exam is in nine months, then you get a diagnosis for your Fibromyalgia. 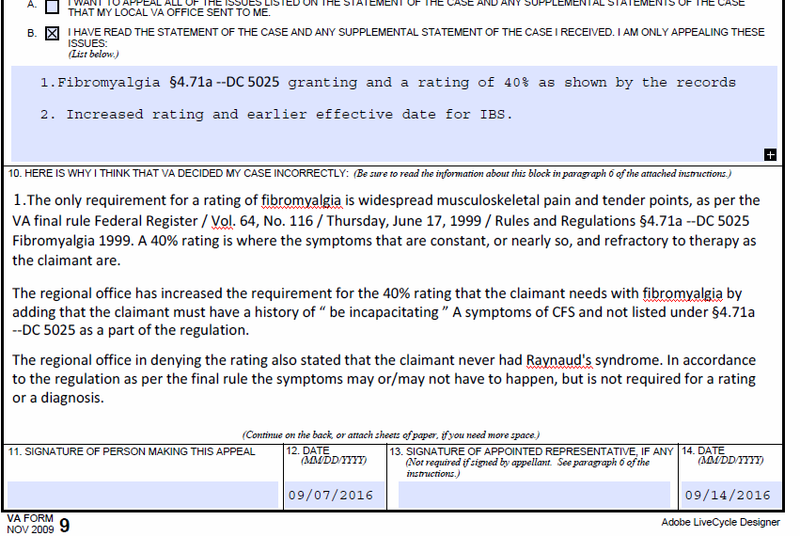 You send in a new claim that was not planned on for the Fibromyalgia 1 month before the IBS results. 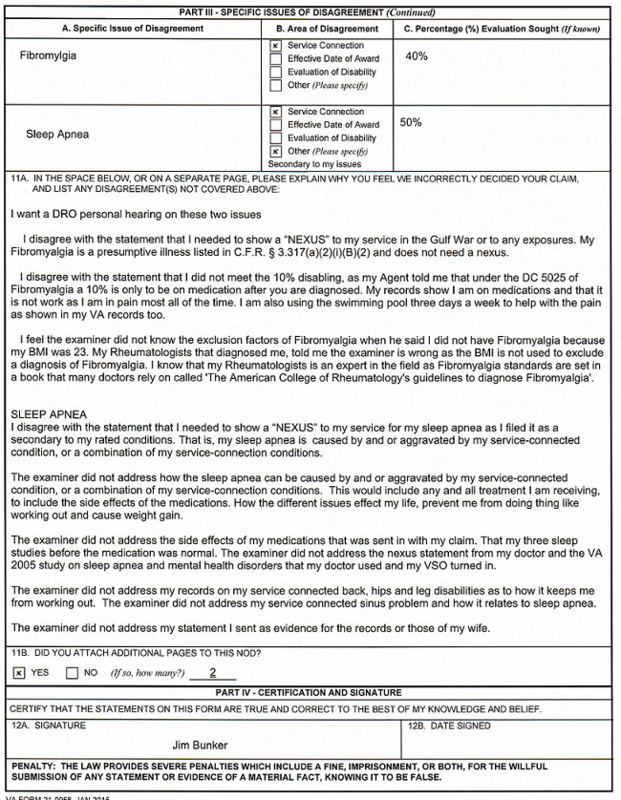 The Fibromyalgia claim used the ITF that you wanted for the IBS claim. The IBS claim was sent in after 11 months of you sending in the ITF, but it now is not covered by that ITF and is given the effective date of the date you sent in the claim. If you had waited and sent them both in on the same 21-526EZ you would have had the same effective dates of claim as the symptoms are in the records. Now the IBS at 30% lost more than 11 months of payment. Once you send the 21-526 and the evidence into the VBA, this will start your claims file, this is known as the C-file and uses you social security number. The VBA will retrieve your military and VA treatment records for you and place them into your C-File. I have seen in the last few years that not only the medical files from the service, but that some of the personnel files are now added to your C-file. The 21-526EZ needs to be filled out with all of the information of your medical care so that the VBA will have the information to decide your claim. You need to list ALL of the VA hospitals you have been treated at to insure the records are with your C-File. Veterans that are able to use the DoD medical system need to list all of the places and times they used the system. Missing information can cause your claim to get denied as the evidence is not there to support it for you. If you need more room, you can use the VA Form 21-4138. You need to list your Unit or Units you served with in combat. This will help in the combat exposure claims. There is in the law for those that “engaged with the enemy” a different standard at times, 38 U.S.C 1154(b). I will not address 38 U.S.C 1154(b) in this guide as there are set guidelines on this type of claim. As it is more for a direct service connection and veterans that were in direct combat, those veterans need to work with their POAs. 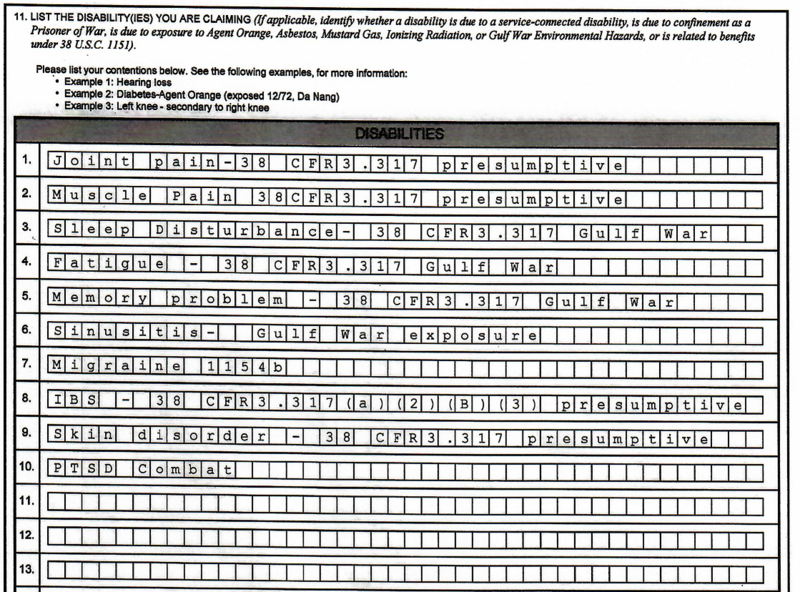 You will need to list all of the disabilities you are claiming. When doing this you will need to address each one of the disabilities to be 1) a presumptive, 2) a direct, 3) due to an exposure, 4) secondary, 5) Section 1154, and so on. Remember that not everything you have is a presumptive to the Gulf War under §3.317, as we have covered in the guide. The VBA does not look at migraines as a presumptive under §3.317. You can claim it one of two ways; but you need the evidence in your file and a nexus. Sometimes you may not get a diagnosis of IBS even after years of testing that ruled out everything else, even the food you eat, milk, medications, and other illness. You then claim the symptoms in your 4138; you say it could be a FGID as per §3.317. This is an example of how to list things on the VA form 21-526EZ. Making the rating officer try to find the needle which proves your claim is valid, in a haystack of other records that have nothing to do with your claim, will not help you. Help them to get it right the first time. Medical evidence is crucial to support your claim. Provide only medical evidence which is relevant for each issue that you are claiming. You need to arrange the medical evidence in the date order and as to each issue that you are claiming. This will make it easier for the Rating Veterans Service Representative (RVSR) and the examiner to see the evidence for the one issue without mixing it up with some other issues. This is how your lay statement will tie your daily symptoms together with the medical reports. Many Gulf War claims fail for the lack of medical reports. Going to your doctors, and your doctor not finding a cause for your complaints’ for the five years you see him/her will provide great evidence for your claim. Not seeing a doctor since you left the service, then filing a claim will not help you. Research can help in some types of claims and is very important medical evidence if used correctly. You cannot just send in the research and say this is why you need to be rated. I have received a lot of calls on our toll-free line over the years on this. You need your doctor to give a nexus statement that uses the terms like; “at less likely as not 50%/50%” or “more likely than not, better than 50%” rationale statement. You can submit large scale peer reviewed studies that give a benefit of a doubt as to the cause of a diagnosed illness; VBA must address the study as well as the examiner. The courts have ruled on this. There have been times the VA 30,000 veteran study has been used to grant service connection for Desert Storm Veterans. The veterans had the illness within ten years of discharge, they had a nexus statement, and their POA used the laws and court cases. It also worked for the Desert Storm Veterans using this study as it was conducted on Desert Storm Veterans deployed before May of 1999. As such, it may or would not work on other groups of veterans, as the exposures have changed some over time. With so many pilot studies that have been done over the years, not one of them will help in a claim. No animal study will ever help you in a claim. The only studies are large clinical and epidemiological studies that will showing a higher rate of a non-presumptive illness in a deployed group vs. a non-deployed group. We have covered in the guide how the law and the courts have ruled as to “non-medical indications which can be independently observed or verified, such as time lost from work, evidence that a veteran has sought medical treatment for his or her symptoms, evidence affirming changes in a veteran's appearance, physical abilities, and mental or emotional attitude, etc.” That means you need to have proof of your time loss from work over the years due to the illness. A statement from your boss or the HR department is needed. This is how veterans working a PTSD claim need to work things, too. You need to get the “bad boy” reports from your job(s) to show you have problems at work. A Gulf War claim is the same way. Then you address this in your own 4138. Remember that if the VBA does not use this, it is a reason for an appeal. Provide a copy of all relevant medical evidence you have from non-VA doctors; this is a must. No matter the type of claim, you must send in a VA 21-4142/4142a on each provider to the VBA to grant permission to obtain medical records from your non-government healthcare providers. While the Regional Office (RO) may always get the files from your private doctors, not turning in the form will give the VBA a reason to deny the claim. If you get a copy from your doctor to turn into the VBA, make a copy for yourself first. If a civilian doctor's office asks you to pay for copies of your medical records, let them know that you are a veteran and need the copies in order to apply for Veteran’s Disability Benefits. Many doctors and/or their office staff will waive their normal copy fee as an act of good will in honor of your service. If the doctor's office offers to fax or mail your records to the VA for you, politely decline. Tell them that the VA is notorious for losing and misplacing records. Tell them you are planning to hand bring them to the VARO so that you can get a date stamp receipt from them with your POA’s help. You may try to ask your doctor to send them to your VSO/Agent. I did have some veterans do this and it was the only way to get the files. Remember you need to be nice; it works a lot better than getting mad at everyone. If you are one of the lucky few to have your service medical records (STR), go through them and make notes of the dates in the records which are relevant to your claim. You will need to address this evidence in your lay statement. You can send in a copy of that part of the records supporting your claim. Remember that you need to not only address the date(s) in the file but show the continuance of symptomology after the service with treatment thereafter. For some issues like skin, GERDS, headaches, and breathing disorders, you could get a direct rating. If you have a record showing that you cut your finger in basic training, or anything else that does not support the claim you are filing, leave it out of the copies you send to the VA. As the finger healed and the record does not show any other problem, the law addresses things like this. Not everything that happened is something you can file a claim for. Filing a claim for the symptoms of your diagnosed illness is adding work for you, your POA, and the VBA. If you use private doctors for most of your care, they will need to fill out Disability Benefits Questionnaires (DBQs) related to your diagnoses and symptoms. If your doctor does not understand the DBQ, it could hurt you in your claim more than it could help. The doctor could fill the form out wrong causing a denied claim or wrong rating. Let your doctor know about the DBQ forms well in advance of your next appointment. It may be best to address it after your doctor has diagnosed you with one of the presumptive illness since the DBQ is not meant to be used to diagnose someone but to rate how disabled you are. This will let your doctor have time to go to the VA website so they can read about the form and learn how to fill it out right. Do have your doctor go online to get a fillable PDF form of the DBQ, the hand written forms are hard to read and do miss a lot of information. When your doctor knows about this beforehand, the test and other information can be found before you come in for the appointment. Only a doctor may fill out a DBQ if you do not want the VBA to disregard it. It is best that your doctor is your treating PCP for some time and has done many of the tests to rule out other illnesses or that you were sent to a specialized doctor (Neurologist, Gastroenterology, Rheumatologists, and Dermatologist) that your doctor referred you to. It is best if your private doctor(s) complete the DBQ, place a copy in their file, give you a copy, and submit it by Regional Office Fax Numbers. The VA may still order a Compensation and Pension (C&P) examination by a VA doctor regardless of the evidence you provide. The VA doctor may want to use DBQs as part of your C&P exam. Do look each of your exams over because many of the Gulf War exams have been inadequate. This was addressed in the 2017 GAO report to Congress; it also addressed how less than 10% of the examiners are trained to even do exams on Gulf War Veteran Claims. When you have an inadequate exam, your POA will need to address it right away in the NOD or Form-9 from that decision or Statement of the Case (SOC). You and your POA will need to keep addressing the inadequate examination until the RO gives you an adequate examination, or that you are given a favorable rating decision for the issue you are claiming. There are some diagnoses for which no DBQ is available, the Gulf War general medical is one of them. Your private doctor may still provide a medical opinion in support of your claim; however, they will not be able to use a DBQ in relation to that diagnosis. In most of these cases, the VA will require you to get an exam from one of their doctors. Your statement needs to flow in some kind of order. Do not jump all over the issue and be right to the point. Start with when the symptom started that your records show and then work up until you filed. VA Form 21-4138 (4138) - Statements in Support of Claim - is the form you have to use to present any lay evidence or personal statements in order to consider them as part of your case. The rules are more relaxed if you do have a true undiagnosed illness, presumptive illness under 3.317 (2). This is covered in their M21-1 Live Manual section on GW claims. Download the form at http://www.vba.va.gov/pubs/forms/VBA-21-4138-ARE.pdf . Get statements from those who you served with during the war if there are parts to your claim that will need these statements. Find those you served with you after the war and people who have known you since your discharge. If they saw evidence directly, or if you complained to them, they can write statements about your different symptoms, or about how your behavior changed. While these statements cannot diagnose your problems, they can attest to what they observe directly, or they can describe a conversation in which you complained of symptoms or how those symptoms affected you. Any statement provided by someone other than a health care professional is lay evidence when presented as part of a claim for disability compensation to the VA. Lay evidence is an important part of a claim, more so for any medically unexplained illnesses, diagnosed or not. The first and most important source of lay evidence for your claim is you. Once you have your symptoms all written out, and a log of when they occur, how often they occur, and how severe they are, you may take that to your doctor as the starting point to build up medical evidence. If you have headaches, do not just say “I had a headache on May 21, 2015,” describe details of the headache. Answer all of the questions that would apply. What is the onset like? Does sound or light bother you; that is, do you need a dark place? Are you incapacitated; that is, lie in bed, until the headache subsides or goes away? How long does it last? What does your doctor say about them? Do you miss any work/family events or cannot go out for more than a day? Does it move from one place in your head to another? Does it make it hard to write, type, or do calculations? Does it make it hard to walk, use your hands in manual labor, or play an instrument? Does the headache start during the day, night, or both? If you have diarrhea, do not just say “I have diarrhea.” Accurately describes your experience; you need to do this as it is the only way to get the proper rating. This is a symptomology-based illness. This will give you something that will help your claim as it is how we were able to get some of the ratings fixed. State when it first started, when you went to the doctor. State exactly how many times a day you go to the bathroom. State how it comes on and what it looks like. How long it lasts, any pain or discomfort. State if you have constipation afterward. State if you take any medication for the diarrhea, whether it's over-the-counter or prescribed, and whether it is working or not. State if you mess you pants and how frequently and when. State what tests were done and when. State what changes in your diet the doctor orders to see if it worked. For each of the symptoms, you should be going to your doctor at the VA, or at least calling the VA and asking what to do. This is not only to get treatment for your symptoms, but to build a paper trail to support your case. These calls to the VA usually go into your file. Your medical file establishes a record of the number and severity of your symptoms which helps you establish your claim. Use the Ebenefit to send messages to your doctors, too. These will help in a paper trail, too. You can use MSWord to write out your statement and edit it and then copy it to the PDF form. Save the form using a new name like “IBS claim” for one and “Migraine” for the other. This way you will know what each one is covering. Have someone read it over for you to insure it is on the point and not some long story. You are addressing an illness and the symptoms, how it is affecting your life today. Remember that a MUCMI or a UDX is only about the illness that has NO KNOWN CAUSE, so do not try to give it one. When a veteran says their MUCMI or UDX is caused by one type of exposure, it sets that claim up to be denied and will make it harder to fight for a win down the road. So remember that only a doctor can point out the cause of the illness. This is not a long story of everything that went on in the war, and it is not anything of what the government covered up. This is not needed and will hurt your claim; you do not need to set up your claim for the wrong track. This example addresses an error in an earlier rating decision. The veteran will need to keep fighting both issues to get the earlier effective day. You always want to be honorable in your statement (tell the truth); if the VBA can disprove anything that is in your statement, then the VBA will deny the claim. Then you have to prove everything with all facts and NO lay statement. I did have this happen in a PTSD claim I was helping on; the veteran made up things that were proven not true about his deployment. Also, do remember that the VA presumes you were exposed to everything. As such, you do not have to bring up any one exposure; doing so will increase your denial likelihood. The first step in appealing a claim is to send your VA Regional Office (VARO) a "Notice of Disagreement" (NOD). As of March 2015, the NOD has to be on the official NOD, VA Form 21-0958. The NOD cannot be a written statement on the VA Form 21-4138 or a letter that states that you disagree with the decision. You must use the VA Form 21-0958 NOD. It will guide you with the information as to the date of the decision that you disagree with, which issues you disagree with, and then why. You have one year from the date of the VA’s notice of its decision to file your NOD with your VARO if it is the first time it was denied. If you miss this deadline, you can only reopen your claim based on new and material evidence or establishing that the VA denial was the product of clear and unmistakable error (which is very difficult to prove). The other exception to these conditions occurs when VA regulations regarding your disability change, with the CMI as to 3.317 in 2002. In that case, you may have the right to re-open your claim based on the change in regulations. You are not helping your claim when you simply dump a pile of loose records on the VA for your appeal. Organize the records and explain their significance in a letter you and your VSO Rep prepare together. Once the VARO makes a decision with respect to your claim, you (and your VSO Rep) will receive a notice of that decision which explains the reasons for the VA’s determination. Read the notice carefully, and discuss it with your representative. Your appeal should address specific reasons why the VA should not have denied a claimed condition, why an awarded rating is too low, or why an effective date is too late. Everything is based on the laws, court cases, and the evidence in your file at the time of the decision. Remember that the “internet pros” do not know most of this or how the court cases will get applied to your claim. Many VSOs have a hard time with that. This is how the benefits are changing all of the time. One court decision can change how the regulation is applied. You need to work with your VSO on writing a good NOD. If your VSO cannot do a Gulf War NOD, it is a good time to shop around. Do not look too long. Remember most first time claims will get denied at the VARO no matter what. You will need to address the errors by the regulation and court cases. You have to address evidence that was overlooked that proved your case. You need to remember the secondary issues, anything you leave out will become a “final” issue after the appeals time runs out. Your rating decision denied four issues, and you sent in your NOD on only three of the four issues. 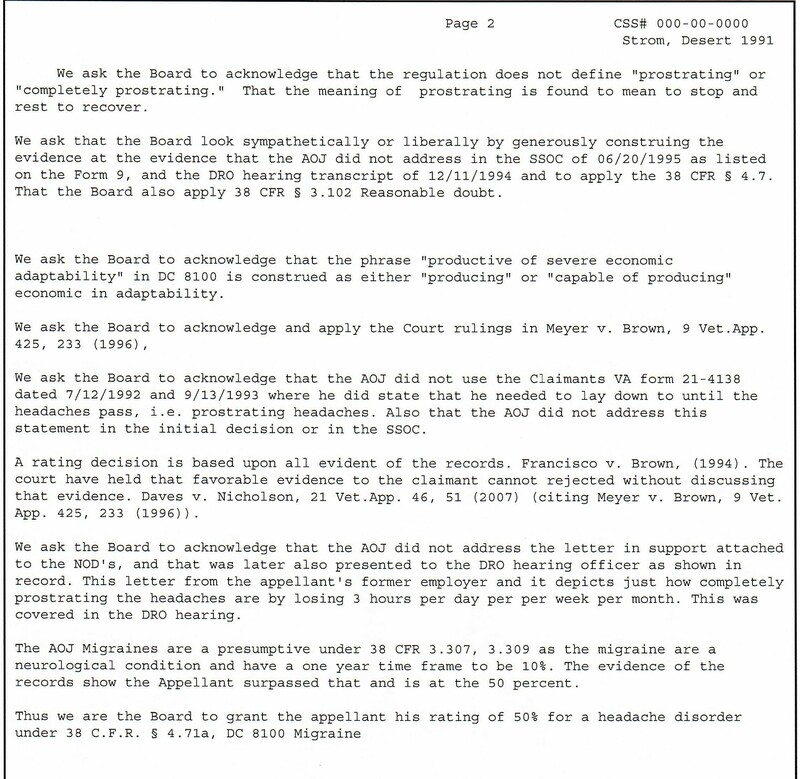 Then, at the DRO hearing two years after the rating decision was made, you bring up the issue on the denial of number four. The DRO stops you as you are first addressing this issue and goes off the record (stops recording). He states that you cannot bring up this issue as it was not on the NOD or form-9. As such, it is not one of the issues on appeal before the DRO. This is true and is why you need to look everything over. In this case, you would need to reopen this missed issue as it became final one year earlier. Be sure to address that you think the rating should be on the NOD, too. You might be service connected for what you asked for but not at the rate, you should be. You would file this on the NOD, too. Make sure to have your VSO to address this too. I did include a small part of the write up as an example but not everything. After the VARO receives your NOD, you should receive a letter that acknowledges your NOD. You will be asked whether you wish to have your appeal sent to the Board of Veterans’ Appeals (BVA) in Washington, DC, or whether you wish to have your claim reviewed on a de novo basis. The latter refers to the VA’s Decision Review Officer (DRO) program. This is an informal appellate process within each VARO. The DRO has the authority to reverse or modify a VA rating decision. We recommend that you seek a DRO review before you request a BVA appeal. The DRO process is frequently successful and is generally faster than going straight to the BVA. If you do not receive a better decision from the DRO, you can still appeal to the BVA. It is best to ask for a formal DRO personal hearing. During the recorded part of the formal hearing, you must ask the VBA to send you a copy of the transcripts and voice recording; it will help you later at the BVA. Once the DRO has made a decision or has received your request for BVA consideration, the VA will issue a “Statement of the Case” (SOC). This document will explain the VA’s decision(s) in detail. You have 60 days from the date of the SOC to file your substantive appeal to the BVA on VA Form 9: http://www.va.gov/vaforms/form_detail.asp?FormNo=9. Your appeal will be certified and forwarded to the BVA for consideration. When doing the VA-Form 9, you, and your POA need to address just what regulation was not applied correctly and what evidence was not used in the decision. You need to point out the studies, exams, your files, if the exam was wrong, why, and the court case that addresses these points. 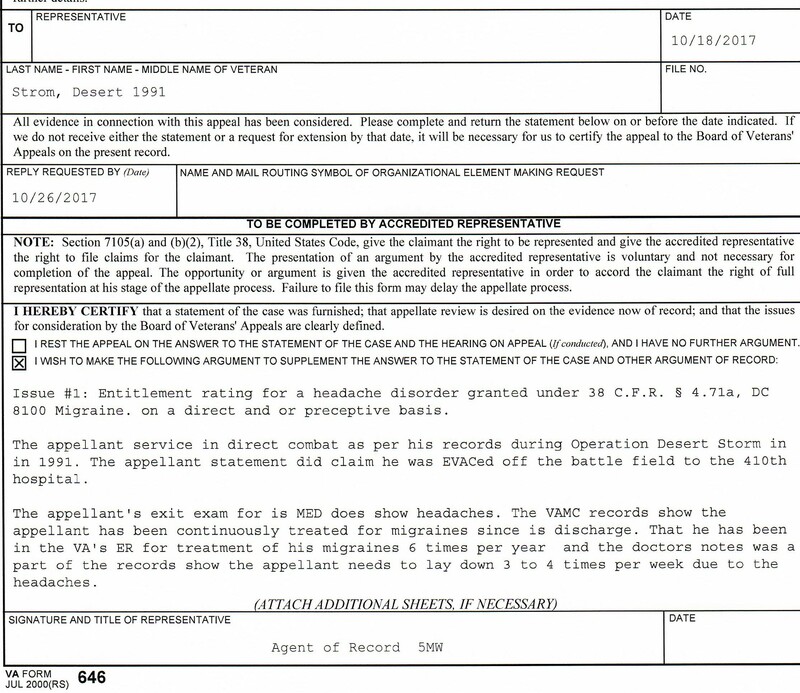 A VSO would fill out a Form 646 (page 59-60) to send in with your Form 9, while Agents and Lawyers will do a more detailed brief. It will outline the case and state why the claim should be granted. It would point to evidence supporting the claim and a high rating and the laws too. When you have a case going to the BVA, you are pointing out the laws and court case(s) that were not applied correctly, the evidence not used, and why your evidence was better. You point out why the VA exam was inadequate. One way is if the examiner used one part of a report but did not use the same report and address the diagnosis you had and the symptoms. This goes beyond this guide. Make sure who ever is helping you is a VA Accredited Claims rep. To many veterans are getting bad advice off the internet that is causeing the claim to be denied. If you have a claim which has already been denied once, and you are looking for highly specialized representation from someone who can spend more time on your individual case, then you may consider an accredited claims agent or accredited attorney to help you pursue your claim. You may look for accredited individuals in your area using the Office of General Counsel (OGC) database where you would locate VSO Reps, at http://www.va.gov/ogc/apps/accreditation/index.asp . To change your representative while the case is at the board, you need to show “just cause.” You can change once the Board makes their ruling and remands the appeal. You will need an attorney if your case is going before the Court of Veterans Appeals or to a higher court. If your case is at the Regional Office or Board of Veterans Appeals, either an accredited claims agent or accredited attorney may help you with the case. Interview anyone you are considering. You may even ask for and contact references before you allow them to represent you. You should find someone who has specific expertise with claims for your type of disability, and who has a proven track record of success. In other respects, you should treat your attorney or claims agent as you would treat a VSO Rep. It is always an advantage, regardless of the nature of the disorder underlying a claim for benefits, to have an accredited veteran service organization representative (VSO Rep) to assist you in the prosecution of a claim for VA disability compensation. These individuals may be called a veterans service representative (VSR) or a veteran service officer (VSO). In any case, the VA accredits them as a VSO Rep. Remember that you are one of about 600 plus veterans that person is dealing with. 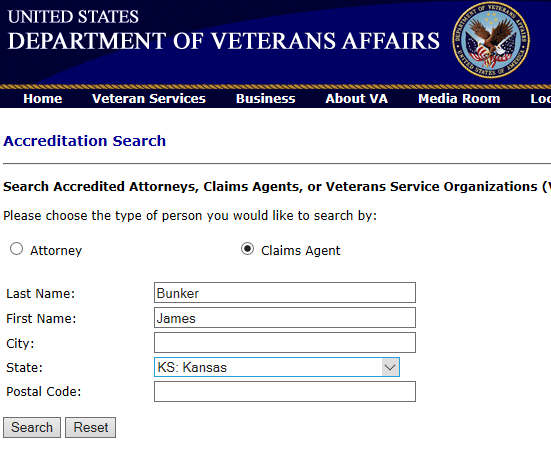 You should only have an accredited VSO Rep working on your case, and you can search the database of the VA Office of the General Counsel (OGC) to determine if a VSO Rep is currently accredited or not at http://www.va.gov/ogc/apps/accreditation/index.asp . Make sure they are, there are some scammers out there. You may also use that link to find a VSO Rep. If you want to work with a particular Veterans Service Organization, or with your State Veterans Affairs office, go directly to their website to locate a VSO Rep who works for them. In some states, there are county VSO Reps.
All accredited VSO Reps are familiar with veteran benefits law and procedures, and they can provide more effective representation than trying to handle the claim yourself. Some are volunteers, and others are paid for by tax dollars or private donations. They may not charge you for their services. Keep in touch. You should talk to your representative at least once per month while your claim is pending. Whenever you get mail from the VA, call your representative to make sure that he or she received a copy (as required by VA regulations) and that you understand exactly what it means. Ask questions. If you do not understand something about your claim, ask. Part of your VSO Rep's responsibility is to ensure that you understand the claims process. Exercise your judgment. Your VSO Rep is charged with acting in your best interests. However, you are the ultimate decision maker with respect to your claim. Your VSO Rep will tell you if he or she disagrees with what you want to do and why. He or she can make recommendations but must do as you instruct. The law permits VSO Reps to resign if there are fundamental disagreements. · Submit a written statement to the VA before a personal hearing. He or she should let you read the statement before it is submitted. · Help you with your statement to make sure it helps the claim and not hurt it. · Understand the laws and regulations 38 USC 1117 &1118 and 38 CFR 3.317. Although it can be a difficult task, shop around for the best advocate. Talk to the prospective representative; ask if there are any limits on his or her representation. Get a feel for the person who will be working for you before you sign a power of attorney appointing him or her as your representative. Claims on exposures and undiagnosed illnesses most likely will not be worked under the FDC fast track. There are some claims as per the guidelines that are not worked under the FDC guidelines. Gulf War Illness (GWI) is a generic term for a variety of medical problems which will be discussed in detail. This guide is not a review of the protocols for medical treatment of GWI; that goal is all too elusive. The primary purpose of this guide is to assist the veteran -- who believes he or she is afflicted with GWI -- with procedures for filing a claim for disability with the Department of Veterans Affairs and enhancing the probability of success in that endeavor. Gulf War Illness is not something you can claim under 38 USC 1117. GWI is only a term to describe the symptoms veterans have from their service in the Gulf War. 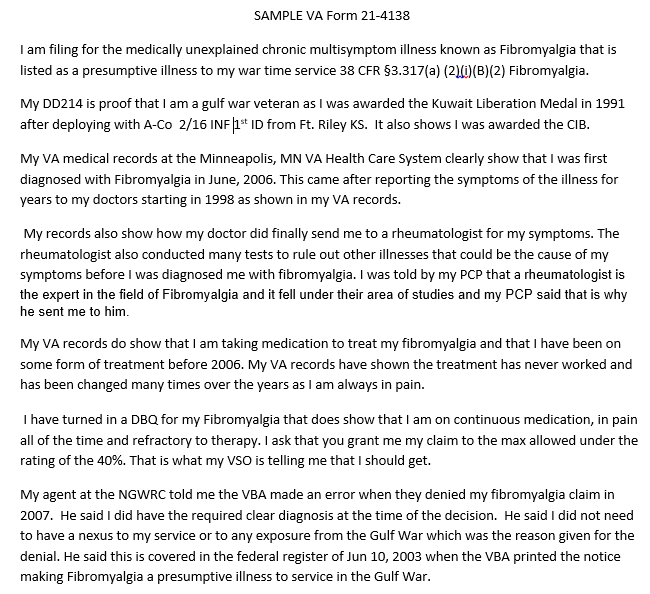 The VA and DOD are working on a case definition for it to be diagnosed as medically unexplained chronic multi-symptom illness, but this has not happened yet. It should be done soon. The contents of this guide are for informational purposes only. Every effort is made to achieve accuracy, but neither the National Gulf War Resource Center, Inc. nor its principals assume responsibility for the accuracy or veracity of the information contained herein. This guide is distributed freely to veterans, Veteran Service Organizations, accredited VA Agents, lawyers, and others interested in helping those who are ill, injured, or disabled due to the Gulf War. Any other use requires the written authorization of the National Gulf War Resource Center (NGWRC) or sources used in this guide. 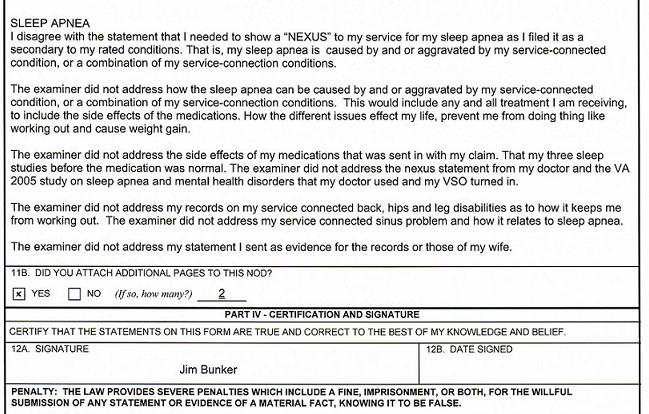 James A. Bunker, Executive Director & VA Accredited Claims Agent. Copyright 2016 National Gulf War Resource Center, Inc.